A field guide to the mammals of Egypt. The first comprehensive field guide to every species of mammal found in Egypt. Each species is illustrated, described in detail, with reference to identification features, status, habitat and habits. A map is also provided showing current and in some cases, historical range. Each species described in detail, with identification features, status, habitat, and habits, and with comparisons to similar species. Includes all marine mammals recorded in Egyptian waters Distribution map for every species. Each species meticulously illustrated-bats and sea mammals in black-and-white, all other species in color. Line drawings of whale blows, bat noseleaves and ear structures, and tracks and trails of selected land mammals. 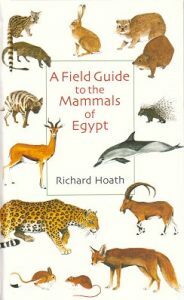 An indispensable reference work for anyone interested in the wildlife of Egypt. Easy to slip into a daypack, and sturdy enough to withstand the rigors of desert travel.